Here is a beautiful and thick hand carved Tiki mask made from premium wood (Acacia) perfect for indoor or outoor! Carving such a mask is actually more involved than a totem the log has to completely be carved out. The mask measures 36 inches by 10 inches thick and heavy. This mask has been hand rubbed and finish with oil to give a smooth and beautiful finish! This is a beautiful piece of art! This Tiki mask was carved with great attention to details. 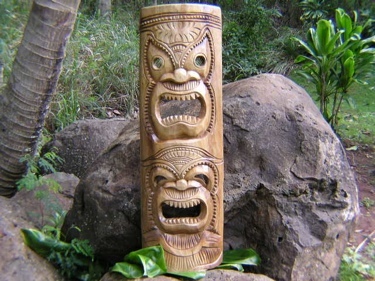 Perfect indoor or outdoor Tiki for your garden!